Written by Zhang Yu. Originally posted in Global Times. Cathy Dong (pseudonym), a 32-year-old office worker in Shanghai and a frequent user of new retail and food delivery platforms like Hema Fresh and Meituan, noticed a significant rise in the amount of plastic bags in her daily life recently. “When I order groceries or fruits from online supermarkets, they often come with a large plastic bag which is free of charge. I have a drawer that stores these plastic bags and it fills up really quickly these days,” she told the Global Times. In June 2008, China implemented a nationwide ban on free plastic bags in supermarkets, shopping malls and markets. After the ban, supermarkets and retail stores started to charge 0.1 to 1 yuan for each plastic bag, and as a result many Chinese consumers started to take their own reusable bags when they visit shopping malls. According to a report by the National Development and Reform Commission in 2013, in five years, the ban cut consumption of plastic bags by at least 67 billion and saved the equivalent of 1 million metric tons of plastic. But as e-commerce and food delivery platforms mushroomed in recent years, and as shopping moved largely from offline to online, experts say the ban’s focus on brick-and-mortar stores is outdated and they are calling for an upgrade of the regulation 10 years after its implementation. “The use of plastic bags by vendors on e-commerce platforms is now a grey area, as the 2008 regulation didn’t specify whether plastic bags can be provided for free in online stores. Regulations on plastic bags and boxes by food delivery platforms is also a blank area. However, these platforms contribute enormously to the growth of plastic waste in China. The authorities should promptly adjust the regulations and include the platforms in the ban,” Mao Da, founder of Break Free From Plastic China, a nonprofit group devoted to the reuse and recycling of plastics, told the Global Times. E-commerce is a major area which sees an alarming rise of plastic bag use in China. An e-commerce package usually consists of a paper box, plastic fillers, a plastic bag and plastic tape to wrap the box. A report by China’s State Post Bureau in 2017 showed that in 2016, China’s couriers used 14.7 billion plastic bags and 330 million rolls of plastic tape. “Only less than 20 percent of the packaging used by couriers can be recycled, and the plastic components in the packaging, such as fillers and plastic tape, are almost non-recyclable due to their low value,” Zhu Lei, vice director of the Qingdao Institute of Beijing Institute of Graphic Communication, told china.com.cn. Currently, landfill is the main way to deal with plastic waste. The issue has alarmed Chinese authorities. On December 17, the State Post Bureau issued a trial regulation on environmental packaging. According to the regulation, the courier industry should standardize, reduce and recycle packages and gradually cut the number of packages. The regulation encourages companies to consider biodegradable plastic bags when they purchase and use plastic packages, and gradually enhance the percentage of plastic bags that meets requirements. It also encourages companies to avoid single-use plastic bags. More harmful than plastic bags is the rapid growth of single-use plastic boxes and cutlery provided by China’s expanding food delivery platforms. China’s food delivery platforms and apps have significantly changed the way Chinese people eat. A report by iiMedia Research this year shows that in 2017, the total number of users of food delivery apps amounted to 300 million, up 19.1 percent from 2016. More than 200 billion yuan’s worth of meals were ordered in 2017. In 2018, that number is expected to reach 243 billion. According to another report by China’s Zero Waste Alliance, a non-profit group that has been promoting waste reduction, Chinese consumers use 40 million plastic boxes each day through various food delivery platforms, which adds up to 14.6 billion plastic boxes a year. 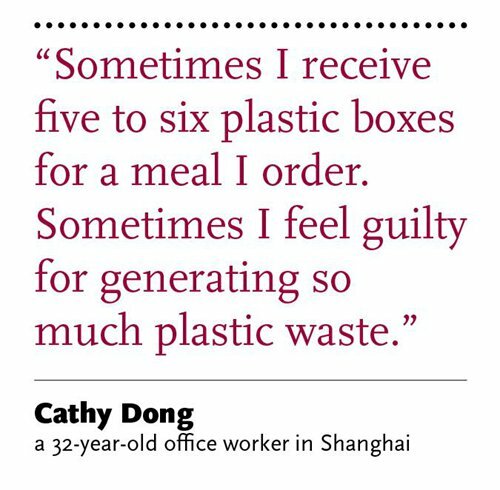 Dong says she sometimes receives five to six plastic boxes for a meal she orders. The boxes hold rice, the main dish, soup, sauce and side dishes respectively. “Sometimes I feel guilty for generating so much plastic waste,” she said. Plastic meal boxes are difficult to recycle. “Compared with Western food, Chinese cuisine is more greasy, and this has greatly affected the recyclability of these meal boxes,” Mao told the Global Times. In September 2017, the Green Volunteer League of Chongqing, a non-profit organization, sued China’s three major food delivery platforms Meituan Waimai, ele.me and Baidu Takeout, for harming the environment by providing single-use plastic cutlery and plastic bags. The volunteer group said the platforms fail to provide options for users to waive single-use cutlery, resulting in a huge waste of resources, according to the website of Beijing No. 4 Intermediate People’s Court. The case is still awaiting a verdict. 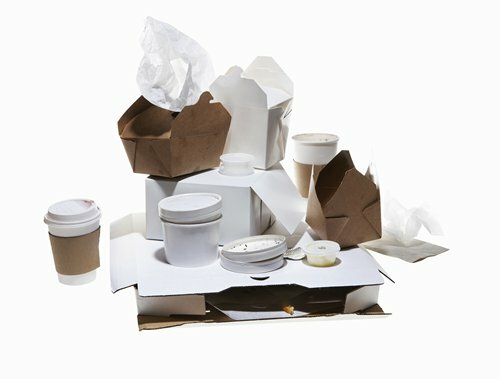 Following the lawsuit, all these food delivery platforms started to offer an option allowing customers to waive single-use cutlery. However, many users found that even though they ticked the option, restaurants still sent them cutlery, fearing complaints. 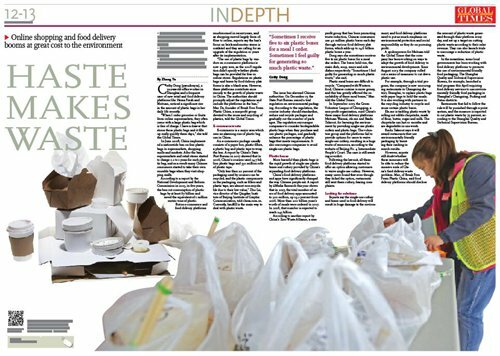 Experts say the single-use cutlery and boxes used in food delivery will result in huge damage to the environment, and food delivery platforms need to put as much emphasis on environmental protection and social responsibility as they do on pursuing profit. A spokesperson for Meituan told the Global Times that the company has been working on ways to adapt the growth of food delivery to environmental development. Since August 2017, the company rolled out a series of measures to cut down plastic use. For example, through a trial program, the company is now encouraging restaurants in Changning district, Shanghai, to replace plastic bags with paper bags to hold the meals. It is also working with partners in the recycling industry to recycle and reuse certain plastic boxes. Ele.me is tackling plastic waste by rolling out edible chopsticks, made of flour, butter, sugar and milk. The chopsticks can last 10 months and are degradable in one week. Baidu Takeout says it will award restaurants that use environmentally friendly packaging by boosting their ranking in search results. However, experts still doubt whether these measures will be able to reduce the massive scale of China’s food delivery waste problem. Mao, of Break Free From Plastic China, said food delivery platforms should disclose the amount of plastic waste generated through their platform every day, and set up a target on cutting plastic waste according to their sales revenue. They can also launch trials to encourage a reduction of plastic waste. In the meantime, some local governments has been working with food delivery platforms to promote the use of environmental friendly food packaging. The Shanghai Quality and Technical Supervision Bureau, for example, launched a trial program this April requiring food delivery services to use environmentally friendly food packaging in Shanghai’s Changning, Pudong and Putuo districts. Restaurants that fail to follow the rule will be punished through a point system, and the measure is expected to cut plastic waste by 75 percent, according to the Shanghai Quality and Technical Supervision Bureau.